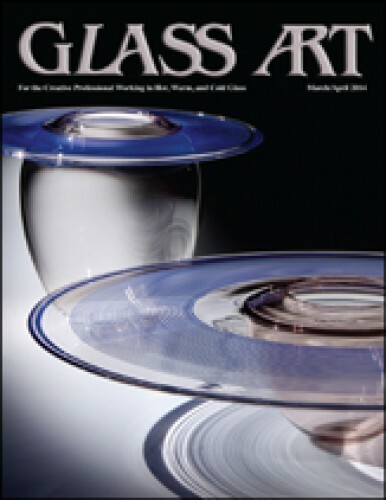 Glass Art editor Shawn Waggoner reminds readers that finding compelling subjects to cover in a magazine dedicated exclusively to creating art in glass is never difficult because of the variety of artists and the ways in which they continue to reinvent the medium. A seminal figure in establishing Seattle, Washington, as a contemporary glass center, Benjamin Moore provides his studio and a top-notch glassblowing team to make the work of the world’s finest artists and designers. 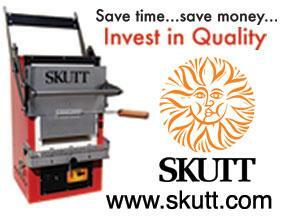 But the true gift of art making within this supportive community is exceptional camaraderie and lifelong friendships. The work of glass sculptor and educator, Mary Baynard White, reflects her interest in sustainable practice as she has gradually begun to use recycled glass and salvaged metals in the creation of her artwork. She participates in various environmental groups and passes her love of working greener along to others through her recycled glass courses. Richard La Londe strives for balance between sheer creativity, meaningful content, and technical prowess. All of these elements come together in the fused glass art that he designs and fabricates for his large public art commissions. For the first time in the history of the Glass Art Society annual conferences, the organization will meet in Chicago, Illinois. The “Day of Glass” event planned by GAS to coincide with the conference will provide a free, open-to-the-public event that will offer attendees a behind-the-scenes look into the world of glass art. As an early pioneer of the Northwest fusing movement, Michael Dupille is accustomed to developing processes and products that allow him to achieve a new aesthetic. His discoveries have included developing and refining many kiln forming processes, especially in the areas of mold making and kiln casting. Mark Veit shares the techniques he has used along with partners Tanya and John Veit when marketing her dichroic glass jewelry across the United States. Having information packets available for distribution, finding galleries and boutiques that are a good fit, and participating in juried shows are just some of the ways to find success in selling glass art. Sharon Carothers, owner of Prism GlassWorks, Ltd., had a thirty-year career in irrigation contracting, wholesaling, manufacturing, and sales when she discovered stained glass as a hobby. That introduction to the medium eventually lead to her purchasing the store, which offered Sharon the perfect way to combine her skills in art, science, engineering, and sales. Karen and Geoff Caldwell have come away from their “just bevels” beginnings in the window business to providing a new line of botanical subjects that combine stained, beveled, and fused glass. They also create tabletop items for their clients that complement the windows, which remain the heart of the Caldwells’ work. The Museum of Glass in Tacoma, Washington, has opened Irish Cylinders by Dale Chihuly from the George R. Stroemple Collection, an exhibition that will run through September 2014. The earliest cylinders feature shamrocks, Irish flags, mapping diagrams of cairns and burial mounds, and the Irish landscape, while later themes explore events from a day in Dublin as described in Ulysses. Master glass painter, Peter McGrain, shares the basic techniques, tools, and materials required for successful tracing in this latest installment of his traditional glass painting series. Design basics, important paint variables, and a step-by-step tutorial for mixing and applying the paints and selecting the appropriate tools and brushes are included. The Stained Glass Association of America Conference Committee has created a new approach to the oldest stained glass conference in the world by planning an artists’ retreat for its 105th Annual Summer Conference. A multitude of creative resources will be available to attendees as well as the Annual Sponsor Showcase, various exhibits, artist presentations, and stained glass tours. In response to a blog spot on the Society of American Mosaic Artists website, members shared why they joined SAMA and the benefits they have received through their membership. The ability to network and build relationships with other mosaic artists, exposure to a wide range of styles, and discovering what mosaics mean to people were just some of the many benefits listed.